Coming from the south coast of England, the summer is just not the same without a few Cream Teas* on those hot days. So when you know you can't eat gluten anymore all you can do is wistfully remember what is was like. So this recipe was a great discovery..
Heat oven to 375 F and grease a baking sheet. Mix dry ingredients and then add butter and process until it has the texture of coarse breadcrumbs. 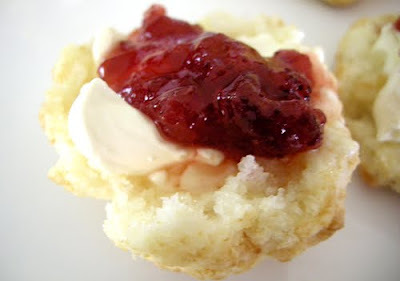 Add buttermilk and mix until it forms one clump and then carefully and quickly make into 8 scone** shapes and place on the baking sheet, ( it is very sticky and should be handled as little as possible). Bake for 10-12 minutes, or until lightly browned. Soft, fluffy and delicious. They are very light and although they do taste different to regular wheat scones**, they are still really good, and even wheat eaters will enjoy them. To replace the butter use a vegan butter that has been frozen before hand. To replace the buttermilk add 1 1/2 tblsp lemon juice into 3/4 cup of soya milk and and let it sit for 5 minutes. Or use 1/2 cup of vegan sour cream per cup of butter milk mixed with 1/2 cup per cup of butter milk of water. ** The North American version of a scone is called a biscuit. grouprecipes.com - GF Toblerone cake! Copyright © Sophie Jane Smith 2015. Simple theme. Theme images by UteHil. Powered by Blogger.